Ofsted's head of research, who had complained of being "rejected" for "settled status" after Brexit, now says his application has been accepted. Prof Daniel Muijs, a senior figure in England's education watchdog, is originally from Belgium but has worked in the UK for more than 20 years. But Prof Muijs has now said on Twitter he is "happy to report" that the Home Office has approved his application. He thanked the Home Office and Department for Education for their assistance - and Ofsted confirmed that the application problem was now resolved. The education expert, who advises on improving England's schools, was one of hundreds of thousands of EU citizens applying over his residency status after Brexit. 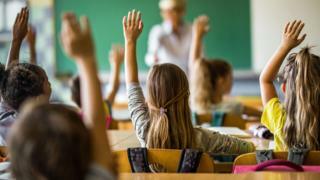 The problem faced by Prof Muijs prompted an angry reaction, with Tom Bennett, the government's adviser on behaviour in schools, saying: "How ridiculous and distressing for you. I'm ashamed you've had to go through this process." The European Parliament's Brexit co-ordinator Guy Verhofstadt said on Twitter that the difficulties faced by Prof Muijs were "unacceptable". Labour MP David Lammy also voiced his concerns - while others argued that it was up to the academic to provide the necessary information. Applicants are asked to show residency for the past five years - and Prof Muijs had thought that more than 20 years of tax and National Insurance payments would have been adequate, including his work as a public official. When the Home Office was contacted about the case, it urged the education official to get in touch with its "settlement resolution centre", so that they could assist him with his application. Prof Muijs says that "additional evidence" has now been supplied and his application has been accepted. A Home Office spokesman said that the system uses "automatic checks against government data" as a way of simplifying the process.